As it closes in on its crowdfunding campaign’s final days, Cogs and Commissars from Atlas Games (Gloom, Unknown Armies, etc.) is not only already over 150% funded, but also in a damn good place to pick up a damn good game. 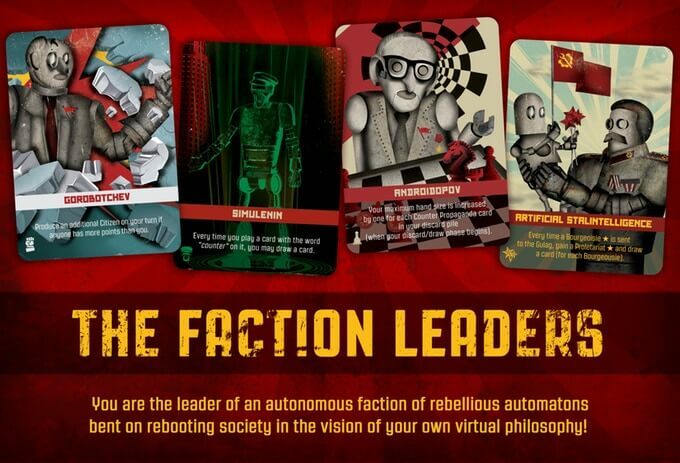 Fuzing card and token management together with a quirky and memorable ‘Robot Proletarian Revolution’ theme. Players each lead a faction using assassins, propaganda and, well, means of production, as to capture the… robot hearts and robot minds of the populace. Preallocated decks are available, however deck-building definitely seems the more interesting option and adds in a more random structure to the game of gulags and Gorbotchevs. Cogs and Commissar‘s theme is most definitely the most stand-out feature. Impressive artwork adorns each of the cards (you can view, or print-and-play, the entire game through the Kickstarter page), with a mass of clever play on words — not least the faction leaders — joining the 1930’s vogue throughout the deck. It’s a relatively fast paced game too, as players are working towards the simple (sounding) goal of accruing enough followers, precisely 15 points worth, as to launch a successful coup and take the reins of the country. 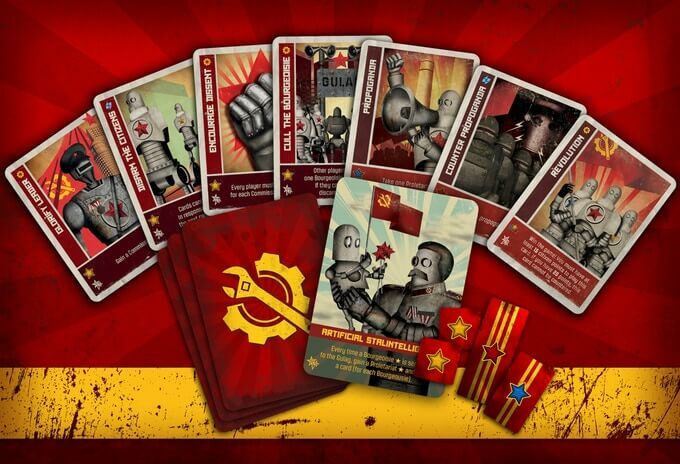 Each of the three populace types, commissars, bourgeoisie, and proletariat, are worth different amounts towards that goal, however a lot of the cards are specifically tailored to neutralising certain classes and sending contrarians to the gulag. This results in a game which becomes longer and more precise as your opponents become more cunning and malicious — and swiping, brutal and destabilising moves become mainstays, and tokens are regularly tossed into, and plucked from the gulag. Pledges for Cogs and Commissars start from $25, which equates to a free copy of the game shipped worldwide, through to $250 which includes a mass of extras, including a permanent tribute to you on the developers website. Cogs and Commissars’ Kickstarter was seeking £8,368 (I’m guessing that’s less arbitrary in Atlas Games’ local currency) before the 1st of March. They’ve already exceeded that, however it remains an excellent opportunity to get your hands on a physical copy of this game for October of this year.